Einz consultancy acts as a catalyst which helps the clients grow faster with innovative, creative & dynamic ideas of execution. We create and execute in a unique way to meet the client requirements. We create portfolios, organize events, customize plans , do the necessary branding in the most cost effective manner; simultaneously reaching the target crowd. 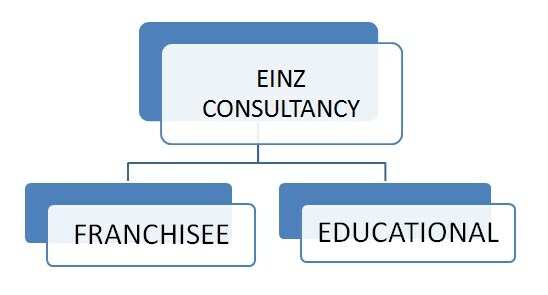 Total Setup: In this stage the Einz Team works in the above manner to shape the business idea into a successful model. Execution : Planning stage where branding , advertising & events are conducted to reach the target crowd. Customize: The stage where consulting and support is provided for the growth of the company. Einz consultancy is the platform for the buyers & sellers to meet each other with complete transparency. The FRANCHISEE SELLERS are basically companies who want to open up branches of their organization nationally or globally. Our firm has tie ups with various companies who place their advertisements on our website to attract the clients online. We have a company /seller profile of around 400 companies. Everyday prospective clients interact with these companies and fulfill their business dreams.